A clafoutis is a classic of the French kitchen and hails from the Limousin region and more usually made with cherries. 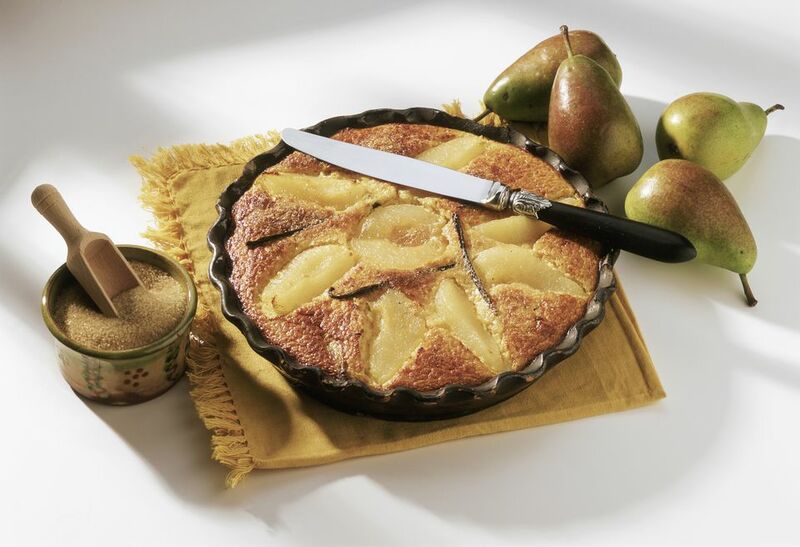 Here, though, the recipe is adapted using pears and brings more of an autumnal feel to the dessert, but so good you can eat it anytime. A touch of freshly grated nutmeg sets off the fresh flavor of pears to perfection, without being too spicy. The Clafoutis is considered a dessert and delicious when eaten warm from the oven, however, when cold becomes more cake like so a lovely treat with a cup of coffee or tea. The spelling of clafoutis varies and is often also referred to as a clafouti. Butter a 9 x 9-inch square baking dish or a 9-inch deep-dish pie round with the softened butter. In a large bowl, whisk together the milk, cream, flour, eggs, sugar, vanilla extract, nutmeg, and salt until it forms a smooth, thin batter. Spread 3/4 cup of the batter onto the bottom of the prepared baking dish and bake it for 2-4 minutes. Watch the batter closely and remove it before it cooks through completely. It should just start to thicken and set when it is removed from the oven. Transfer the dish to a heatproof surface and arrange the pears over the hot batter. Pour the remaining batter over the pears and bake for 35-40 minutes, until a knife inserted in the center comes out clean. Other fruits to consider are summer apricots. To make an apricot clafoutis, cut the apricot in two and remove the stone then proceed with the recipe as above, using the apricot halves instead of the pears. Strawberries, blackberries, even fat, juicy blueberries work well in this classic recipe. Apples can be used, but add a touch of lemon juice to prevent the apples from browning and spoiling the appearance of the dessert.